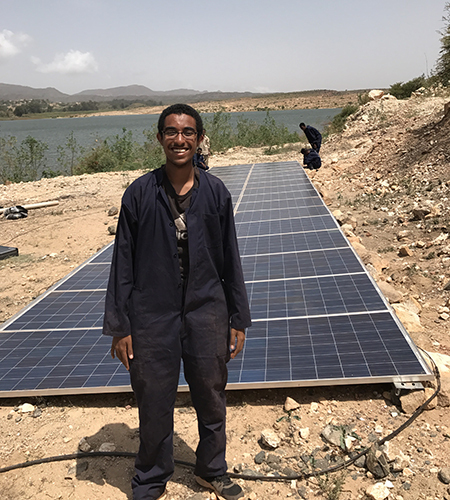 While working on a solar farm project in the small East African nation, Sengal sought to confront the systemic lack of electrical infrastructure that affects the growing population of Eritrea and the African continent in general. The project led by solar firms E-Tech Solar and Erisolar is part of a movement by the Eritrean government to reduce energy reliance on fossil fuels by moving toward more sustainable methods of energy production like solar. For those who know Sengal well, it comes as no surprise that he would commit himself to such an innovative project in a country that is working hard on its path toward development. This passion for service extends back to high school and his work with the Meadowbridge Pathfinder Club, a scouting organization. He regularly participated in food drives to assist the homeless community in Richmond. As a student leader at Virginia Tech, Sengal seeks to extend his abilities to make a positive change in his school community by serving on his class’s ring design and ring dance committees, which are tasked with coordinating Virginia Tech’s traditional ring dance event, marking the transition from junior to senior year of college. According to Sengal, his experience working on the Eritrean solar farm influenced his studies going into college. Now as an electrical engineering major, he intends to devote his scholarship enrichment funds toward research in solar cell efficiency. Inspired by the lessons he learned in Eritrea, Sengal looks forward to continuing his education and service activities far into the future.